Hukamnama Sahib today is by Guru Teg Bahadur Sahib Ji Maharaj in Sorath Raag from Ang 633 of Siri Guru Granth Sahib Ji Maharaj. Satguru Sache Patshah Dhan Guru Teg Bahadur Devji Maharaj kirpa karde ne. Maharaj ji is Blessing us today. Satguru Patshah ji in this Hukamnama Sahib today is talking about friendship which is a true friend. Where can you find a true friend? Maharaj begins in the Sorath Raag - sorat(h) mehalaa 9, By Dhan Guru Teg Bahadur Sahib ji Maharaj the shabad begins with the first two tukan, the first two lines as Rahao. And you will find this trend throughout Guru Teg Bahadur Sahib ji's Bani in Guru Granth sahib the first two tukans in their shabads inside Guru Granth Sahib excluding sorat(h) mehalaa 9 obviously the first two lines are the Rahao lines, the Pause lines to think about. Eih Jag in this Jag meeth, jag means the world meeth means friend, meeth n dhaekhiou koee, Dhan Guru Teg Bahadur says dhaekhiou means to see koee any, n is obviously negative, Dhann Guru Teg Bahadur Sahib ji Maharaj says eih jag, in this world, meeth n dhaekhiou koee, I have not seen, I have not found any being who is worthy of being called a true friend. Friendship is not just about the exchange of worldly goods. Friendship inside GGS ji is a concept. GGS ji says eeth ooth nehee beeshhurrai so sa(n)gee ganeeai || that one, that being you can grab hold of and who doesn't let go of you in this world and the next that is a true friend. Maharj ji says eih jag meeth n dhaekhiou koee || I have not seen anyone worthy of this type of a true friend. sagal means the whole, jagath means world, apanai, means their own, sukh means happiness, laagiou means be attached. Everyone is attached in accumulating happiness for themselves Dhukh mai sang n hoee and Guru Teg Bahadur Sahib ji Maharaj says in times of Dhukh in times of pain, sang - sang means company, n hoee, means nobody is there with you. dhaaraa means partner, spouse, husband or wife. meeth meaning friend, pooth meaning sons and daughters, sanabandhhee - all of those people who are relatives, those people who we say are our life partners, of our husband or wife, those people who we say are our friends, those people who we say, these are my children, those people who we say these are my relatives sagarae dhhan sio laagae. Maharaj ji says that each one of them sagarae are laagae are attached to dhhan, to wealth. Jab hee niradhhan dhaekhiou nar ko, nar ko means human being. Everybody is attached to worldly glory and worldly wealth and when you lose your worldly wealth you lose your worldly friends. When someone sees jab hi, when someone sees one is niradhhan, that the other person has become poor, sang shhaad sabh bhaagae, they all shhaad, they all leave their sang, their company bhaagae means to run away. Guru Teg Bahadur Sahib Ji Maharaj says kehou(n) kehaa, what can i say yiaa man bourae ko, to this crazy mind of mine ein sio naehu lagaaiou. Instead of attaching my naehu, my love, to that friend who is going to be with me in this world and the next, I attach my friendship and my love to these. My mind is like a dog's tail suaan pooshh, suaan meaning dog, pooshh meaning tail. Just like the tail of a dog and there is a colloquial saying in Punjab - even if you were to put a dog's tail inside a straw for twelve years it would still come out being crooked. Just like the dog's tail can never straighten out, suaan pooshh jio bhaeiou n soodhho, Guru Tegh Bahadur Sahib Ji Maharaj says - soodhho means to straighten out - Just like nothing can straighten out the dog's tail bahuth jathan mai keeno, I have tried many ways, jathan means methods I have tried many different methods of straightening out my mind,Ii have tried many different methods of breaking the attachment from those things which are destructive and joining my mind to Akal Purakh. Now Guru Tegh Bahadur Sahib Ji Maharaj says 'O Human being! if you are coming to this realization that there is no other friend, then let me tell you the one friend who will be with you in this world and the next is Akal Purakh, Waheguru the life of God which pervades through all. Maharaj ji says, if you want to make friendship with that life what do you have to do? Guru Tegh Bahadur Sahib Ji Maharaj says fall down at the door of God, fall down at the Gurudwara - the Guru's door and say 'O Guru laaj biradh kee raakhahu, please look after laaj, please preserve the honour of your biradh, biradh means nature. Now what does it means - O guru, I know that my mind cannot stray in itself and I know that all around me I cannot find true friendship, I have fallen down at your door and i am begging you - that i have heard that if someone falls down at your door you take them to the door of God. That is your Biradh that is your nature. 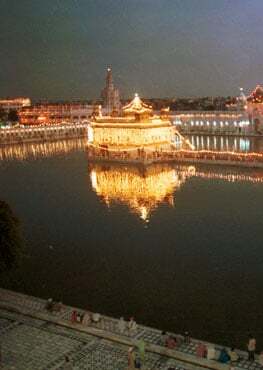 The nature of the Guru is to uplift those who are downtrodden, those who have fallen down. Guru Sahib ji is saying, cry out like this - Say Hey Guru, O Guru please preserve the honour of your nature. I know its your nature to look after those who have fallen down. Naam thuhaaro leeno, leeno means to take. I take (utter) your name upon my tongue and I cry out. If you want to put friendship with the One who will never let go of you, the first step is to take his Name (Naam). If someone is walking across the street, think of this, how many times do you walk amongst different people everyday in your lives, the connection only begins when we start speaking to the person next to us. We can walk past the same person thirty times but the connection will only begin when we start speaking to them. In the same way only when we start calling out to God, only we when we start chanting the Guru's mantar can we begin to walk on the path of friendship with God - our only True Friend.